Background: Selenium nanoparticles (SeNPs) have gained significant importance because of its bioavailability, least toxicity, its interaction with proteins and its biocompatibility. 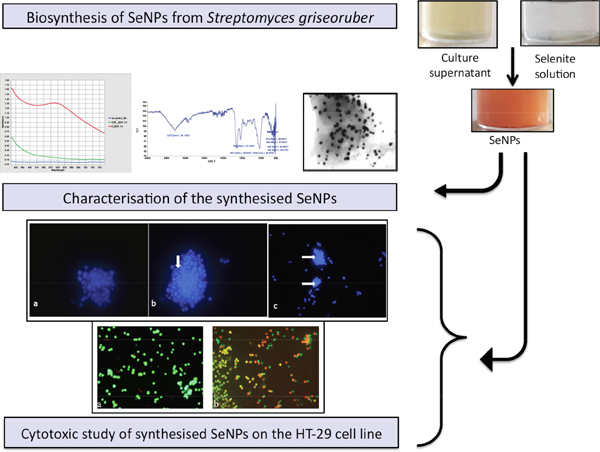 Objective: In the present study, the extracellular synthesis of SeNPs was carried out by using culture supernatant of Streptomyces griseoruber, an Actinomycetes member isolated from the soil and cytotoxicity was tested on HT-29 cell line. Method: Culture supernatant was mixed with 1mM sodium selenite for the biosynthesis of SeNPs. Characterisation of the synthesised SeNPs was done by UV-Visible spectrophotometer, FTIR, XRD, DLS and HR-TEM. The cytotoxicity of nanoparticles on HT-29 cell line was studied by MTT assay and with different staining procedure. Result: Bioreduction of SeNPs was confirmed by UV-Visible spectrophotometer that showed the peak at 575 nm. Size and distribution of the biosynthesised SeNPs were analysed by HR-TEM that showed the formation of particle size in the range of 100-250nm. The synthesised SeNPs showed good cytotoxic activity against HT-29 cell line with 40.5%, 33% and 23.7% of cell viability at 2µg/ ml, 4µg/ml and 30µg/ml concentration respectively. Conclusion: The present study reports the simple and eco-friendly synthesis of SeNPs that showed good cytotoxic activity against HT-29 cell line suggesting that biogenic SeNPs could be a potential chemotherapeutic agent. Biosynthesis, bioreduction, cytotoxic activity, selenium nanoparticles, staining, Streptomyces griseoruber.